Justification: lettering of both consecutive inscriptions; lines 1-2 earlier in the 4th century (Hiller von Gaertringen; perhaps ca. 350?) than the remainder (probably early Hellenistic?). Thera . Found at the presumed site of temple of Meter near the church of Hagios Georgios; further description in Hiller von Gaertringen. Current location unknown (Museum of Thera?). Marble stele, intact and with moulding at the top. Hiller von Gaertringen well remarked that the letters in lines 1-2 are older and somewhat larger. The remainder of the inscription was therefore inscribed afterward. No precise measurement are given for the letters added a posteriori, which appear to be early Hellenistic. Letters (lines 1-2): 1 cm high. The round letters appear distinctively smaller, especially in lines 1-2; early and open sigma. Edition here based on Hiller von Gaertringen IG XII.3 436, with a dr.
Cf. also: Ziehen LGS II 128; Sokolowski LSCG 134. Further bibliography: Buck 1910: 151 and 156, with 260-261 no. 9; Jim 2014: 28-52. (Earlier inscription) Boundaries of the land of the Mother of the Gods. (Later inscription) God, to the Good Fortune of the Good Genius. Sacrifice of Archinos: in the first year, they will sacrifice an ox and a medimnos of wheat; and two medimnoi of barley-grains and a metretes of wine and all the other first-offerings which the Seasons (lit. the Horai) bring, on the fifth of the months Artemisios and Hyakinthios. (Inscription plus ancienne) Bornes de la terre de la Mère des Dieux. (Inscription plus tardive) Dieu, à la Bonne Fortune du Bon Génie. Sacrifice d'Archinos : la première année, ils sacrifieront un bovin et un médimne de froment; deux médimnes d'orge et un metretes de vin, ainsi que toutes les autres offrandes préliminaires qu'apportent les Saisons (lit. les Horai), le 5 des mois d'Artemisios et de Hyakinthios. This relatively small stele originally designated the boundaries of the land of the Mother of the Gods, probably belonging to a sanctuary of Meter on Thera (see above on Provenance). Two other small inscriptions relating to the same cult, IG XII.3 437-438, were found there, as well as two sculptures of lions. For the cult of Meter, see also here esp. CGRN 71 (Metropolis), CGRN 175 (Priene) and CGRN 211 (Maionia). As elsewhere on Thera, the text intriguingly uses some Ionic forms (οὖροι line 1), and the remainder is marked by conspicuous absence of Doric forms: on the dialectical variants on Thera, see Buck. At a somewhat later date, probably in the early Hellenistic period (or after 335 BC), a further inscription was added to the boundary stele. After an elaborate and rather unique formula of invocation (lines 2-5), this document, which now takes up the bulk of the stele, is identified as the "sacrifice" of a certain Archinos. Who this individual was remains wholly unclear: Archinos is a relatively common name, but attested only here on Thera, and his father's name is strangely omitted. Most scholars assume that Archinos in some way "founded" the cult or at least provided lands from which regular offerings could be made for the goddess (see Sokolowski, with further references). For private cult "foundations", i.e. usually dedications or testamentary acts, see here e.g. CGRN 104 (Halikarnassos) or CGRN 106 (Kalauria). The absence of any stipulations concerning a bequest or other form of donation by Archinos remains puzzling. An alternative is that we have here a member of the priestly personnel, who took it upon himself to inscribe rules concerning the cult and to append these directly on the stele (cp. CGRN 54 and also CGRN 46 [both from Piraeus] a priestly proposal which was officially ratified by the city). In this scenario, Archinos would have recorded the sacrifice that he undertook and his primacy in doing so (cf. "in the first year", lines 6-10; cp. IG XII.3 1324 from Thera, which begins Ἀγλοτέλης πράτισ|τος Ἀγορᾶν..., with discussion at CGRN 47), and then encouraged others to follow his example; cp. also the attractive potential parallel of CGRN 128 (Lissos). But the phrase 'Sacrifice of Archinos' remains enigmatic, as well as the fact that Archinos does not mention his priestly capacity (cp. but compare CGRN 28, Thasos). Lines 2-5: Although Ἀγαθή Τύχη and the Ἀγαθός δαίμων were often associated (cf. here e.g. 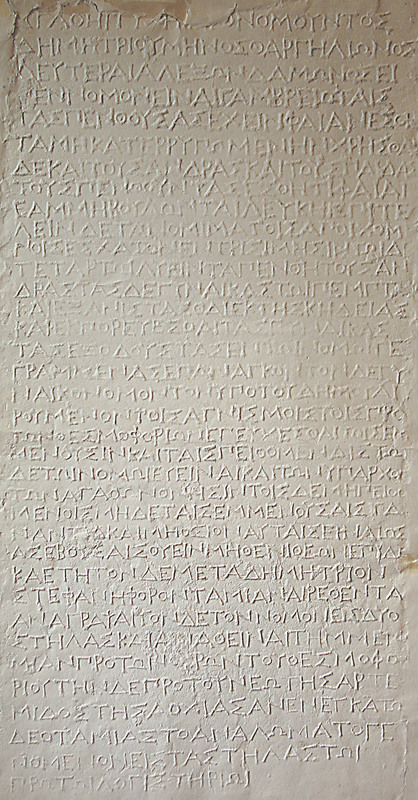 CGRN 104, Halikarnassos, lines 34-35, and also SEG 47, 210, the reference to the "Good fortune of the Good Genius" forms an unparalled form of invocation in epigraphical sources. Lines 6-10: Archinos enjoins worshippers "in the first year" to sacrifice an ox and a medimnos of wheat. Given the accompanying measure of wheat, Ziehen assumed that what was really meant was a cake shaped like an ox (cp. here CGRN 72, Athens, in which a ἑβδόμους βοῦς needs to be sacrificed, a cake shaped like the crescent of the new moon as well as the horns of an ox.). We prefer to follow Sokolowski in thinking that an ox was actually to be sacrificed, since referring to a "cake" as a "βοῦς" seems unusually ambiguous and thus unexpected in a direct address to worshippers. What exactly was meant by "in the first year"? There are several possibilities: Archinos may have alluded to his primacy in inaugurating this form of sacrifice (see above) which was thereafter to be repeated year after year (this is not expicitly stated, but clearly implied); or the more complex option is that he intended a specific sacrifice to take place "in the first year" only, or perhaps in the first year of a cycle of rituals. Indeed, supporting the later option, it remains unclear whether the punctuation in line 10 is to be taken as separating the rites "in the first year" from the remainder of the sacrifices, which would then have taken place on specific dates; this is possible, though perhaps unlikely. Lines 13-15: In addition to wheat (above lines 6-10), but also a measure of barley and wine, the sacrifice is to include other seasonal products, literally "the other ἐπάργματα which the Horai bring". For ὡραῖα, see here CGRN 56 (Marathonian Tetrapolis), col. II, lines 30-31; note also that the foundation of Xenophon at Skillous (Anab. 5.3.13; cp. IG IX.1 654) involved probably a similar "tithing" of seasonal products from the land of Artemis Ephesia: τὸν ἔχοντα καὶ καρπούμενον τὴν μὲν δεκάτην καταθύειν ἑκάστου ἔτους. For a discussion of ἐπάργματα and related terms, see generally Jim and, in a more sacrificial context, cf. here CGRN 61 (Athens), line 1. Lines 15-18: Two dates are mentioned here: the fifth of the months Artemisios and Hyakinthios respectively. The fifth day may have represented a special day to honour Meter, or perhaps have had a meaning for Archinos himself. Testimonia concerning the calendar of Thera are poor, but given parallels with the rest of the Dorian world, it is likely that the months occurring here will have fallen in the spring or early summer: Artemisios first, followed by Hyakinthios, as in the text. For a rupestral inscription from Thera prescribing dated sacrifices, notably on 24 Artamitios (followed by a festival called the Agoraia), cp. again CGRN 47; for other dated rituals on Thera, see the foundation of Epikteta, CGRN 152, lines 109, 133 (other months). CGRN 60, l. x-x (http://cgrn.philo.ulg.ac.be/file/60/). <lb xml:id="line_2" n="2"/><name type="deity" key="Theoi"><w lemma="θεός">Θεῶν</w></name> <name type="deity" key="Meter"><w lemma="μήτηρ">Ματρί</w></name>. <lb xml:id="line_18" n="18" break="no"/>υ</w></name> <w lemma="πέμπτος">πέμπται</w> <w lemma="ἵστημι">ἱσταμένου</w>. <p>(Later inscription) God, to the Good Fortune of the Good Genius. Sacrifice of Archinos: in the first year, they will sacrifice an ox and a <foreign>medimnos</foreign> of wheat; and two <foreign>medimnoi</foreign> of barley-grains and a <foreign>metretes</foreign> of wine and all the other first-offerings which the Seasons (lit. the Horai) bring, on the fifth of the months Artemisios and Hyakinthios.